Planted here with Rise and Shine yellow miniature rose, Veronica spicata Blue is blooming well by early May and will continue to bloom as long as the temperatures don't rise much over 90. 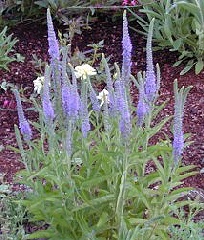 Veronicas dry out easily and do best when mulched and grown in full sun or morning sun and afternoon shade. Unlike some plants that easily wilt and die, Veronicas will wilt, but there is usually still time to water them and turn them around. This makes them good water meters for your garden. They are actually extremely resilient. 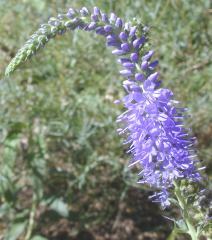 The elegant bluish purple spires of Veronica reach only about 18 inches tall and make an excellent filler for taller open at the bottom plants like milkweed. Planted in front of taller plants, like Bee Balm, their color can break up an other wise monotonous sea of green. Veronica is one of the six plants chosen to be in our English Cottage Herb Garden.